Turkey’s been going through some difficult times in the last year or so. Fortunately for Turks, their economy is not dependent on one factor: oil, like Venezuela, or tourism, like the Maldive Islands. Nevertheless, tourism is a big earner, and that sector took a few hits in recent years. A trigger-happy Turkish pilot (let’s call him that) shot down a Russian Mig – and in retaliation, Russian holiday-makers were ordered to stay home in their frozen wastes instead of flocking to the beaches on Turkey’s Mediterranean coast. Then various wealthy Western governments (including my own beloved New Zealand) started advising their citizens to avoid visiting the country – though I think the annual Anzac Day pilgrimage was relatively unaffected. Well, the Turkish Lira’s not doing so well at present, but (or maybe, so) the tourists have been flocking back. 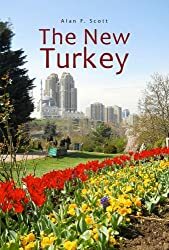 The people at Bloomberg published a piece of research showing that Turkey ranked 4th this year in a list of ten countries “where tourism is skyrocketing”. Then the “editors and experts” of Time Out produced a list of the “Fifty Coolest Neighbourhoods in the World”, and Istanbul’s Kadıköy was on it. Now I have to tell you, I have mixed feelings about the effects of tourism on a country’s economy, not to mention its natural environment. And I have some doubts about the taste of people who would rank Los Angeles at No. 9 and Istanbul at No. 43. I was also a little surprised to see London’s Peckham come in at No. 11. When I worked there briefly as a high school teacher 20 years ago, “cool” was not a word I ever heard applied to the district, but clearly times have changed. Still, these days, I think most Turks will be grateful for any encouragement they receive from western news sources. Anyway, I was moved to get out on an overcast Tuesday and check out some of what Istanbul has to offer. I took a ferry over to Eminönü in the old city, and headed for the Archaeology Museum. One of my favourite trees, a plane tree by the tram station at Gülhane. Not as big as our Tane Mahuta, but it must be a few centuries old, and seems remarkably healthy. Model of a Byzantine-era trading boat in the museum garden. One of 37 ships dug up from the ancient Harbour of Theodosius during excavations for the Yenilapı Metro Station. It was a 10-metre-long and 2.30-metre-wide cargo ship, and is supposed to be the most accurate example to date of a small commercial ship once used in the Middle East. One of a group of votive statues dating from the 3rd century CE found during excavations beside the Golden Horn in 1949-50. Believed to have been part of a nymphaion (commemorative fountain) or a museion (a building dedicated to the works of the Muses). A sarcophagus dating from the Imperial Roman period. There was a vast necropolis in the city of Chalcedon (modern Kadıköy) that was used between the 6th century BCE and the 3rd century CE. Sections of pipe used to bring water from forests outside the city of Constantinople to cisterns in the city which then supplied the fountains and public baths. Part of the head of one of the serpents forming a column in the centre of the Roman hippodrome. The headless creatures can be seen entwined outside the gates of Sultanahmet Mosque. A mosaic panel discovered in the Kalenderhane Mosque, formerly a Byzantine Church dating from the 12th century. A fountain presented as a token of friendship to Sultan Abdülhamid II by the German Emperor in 1895. Abdülhamid is generally condemned in the West as one of the more evil Ottoman sultans (“The Red Sultan”), accused of slaughtering thousands of helpless Armenians in what are often labelled the “Hamidian Massacres”. Well, clearly Kaiser Wilhelm viewed the matter differently. I’d strolled past that fountain many times before without making the connection. A recently restored Roman underground cistern built by the Emperor Theodosius in the 5th century CE – opened to the public with free admission! This entry was posted in Abdulhamid II, Archeology, Constantinople, history of Turkey, Istanbul, museums, treasures of Turkey and tagged Archeology Museum, tourism in Turkey. Bookmark the permalink. I am happy to see this through your camera lens, Alan. Such beauty! Istanbul is an amazing city, for sure!